I love Kathmandu Aran and may have a substantial stash of this unusually soft tweed. 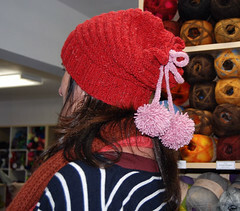 A while back I needed a project for two skeins and I found the I Heart Pompoms hat by Karen Borrel on Ravelry (no financial affiliation with Little Knits). 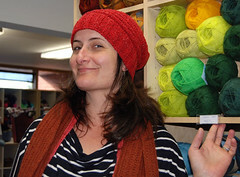 This is an easy and fun hat pattern that works with a wide range of yarns – easy to adjust – and Kathmandu Aran worked great with it; the slouch perfect without being too droopy and the hat warm without being hot. 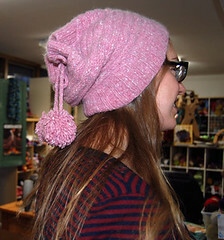 So I made a pink Pompom hat for myself. Last week my friend Rebecca saw the hat, liked it, and when I said I could make one for her she made happy sounds so of course I had to knit one for her. It has been a while since someone has actually been happy and excited to receive a knitted item from me (if you have kids who run hot you too may know what I mean). 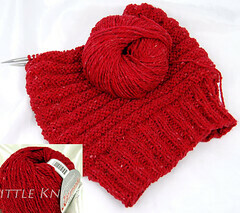 I cast Rebecca’s hat on last Tuesday with Kathmandu Aran Color #180 and Sunday evening, after a total of 3-4 hours of – slow – knitting, the hat was done! The only change I made in the pattern was the i-cord that bunches up the back. Instead of a knitted i-cord I crocheted a narrow ribbon like piece. I don’t know why but i-cord takes me a long time to make and can become challenging – probably only for me – as it falls off of my needles. The look is slightly different than an i-cord but the functionality is the same and the effort of making the cord is much less of a struggle for me with a crochet hook. Rebecca picked her hat up today and it made me happy to see her smile. And I think she looks super cute in it. 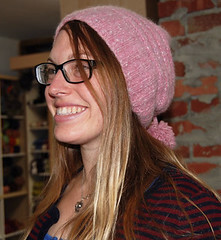 When the recipient is this happy it makes the knitter want to cast on another hat…I just might have to do that right after I publish this post.